Author’s Note: This story was written at 6pm tonight. It wasn’t posted until 9:48pm because we still don’t have Internet back in Brookland yet. 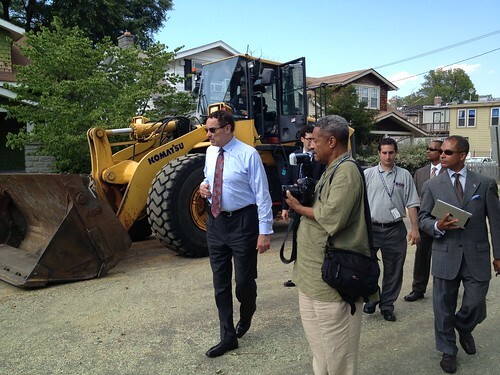 I got home after a long hot day in the sun working with my clients to restore their operations, as a friend said that Mayor Gray, fresh off an overnight flight from China on Sunday, would be in my neck of the woods. I walked the two blocks to 18th & Monroe St NE where a large tree had been blown into power lines on Friday. The tree wasn’t the only one down in Brookland and Woodridge, and the storm wasn’t the first to take power for an extended period of time. The previous Friday a microburst struck the neighborhood and again sent mature trees into the elevated power lines that Pepco has refused time and time again to underground. The Mayor was a welcome sight, as his black-on-black Lincoln Navigator was also accompanied by a pair of dump trucks that are part of the Bridge & Tunnel repair team and a pair of front end loaders. 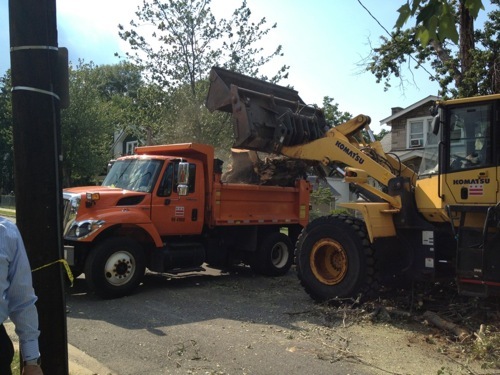 About ten minutes after the mayor met with some of the affected residents, the stump of the tree – freed from Pepco wires on Saturday night late – was hauled off. Mayor Gray said, of the outages, that “this will continue to happen,” until Pepco can underground the lines that run through so many residential neighborhoods in the city. Pepco has resisted attempts to underground the lines citing expense, though the utility has never been able to clearly identify a cost that can be agreed upon. The city had budgeted $1-4M for the streetscape along 12th Street NE in Brookland from Rhode Island Avenue to Michigan Avenue, but then Regional VP for Pepco Vincent Orange Sr. suggested that the costs would be much higher, and the money for that undergrounding project was scuttled. The Mayor, and his Director of Communications Pedro Ribeiro were both fairly pessimistic about the chances to get Pepco to listen to the pleas of the area citizens, citing a lack of full autonomy for the council before the whims of Congress, and the heavily-connected resources that the utility wields in the public arena. Gray was also quick to say, “I’m not their best friend right now,” suggesting that the Mayor wouldn’t roll over. Gray – and the City Council – would be wise to quickly tie any potential rate hike – Pepco is on the record asking the council for an increase in subscriber rates – to a comprehensive plan to underground the lines through major corridors over the next 5 years and increase the efforts made to prevent tree-based outages, and add a longterm plan to underground lines throughout the city. The city has the opportunity to split the cost for this new conduit system with other providers of local wire-line services including Verizon, RCN and Comcast, all of whom are reeling from major outages throughout the city in the wake of the derecho storm on Friday night, all caused by trees and piggybacking along the same infrastructure. The Mayor and the Council have a unique opportunity to forge a good coalition of local utilities, and create private sector jobs, while also fostering good will with the citizens throughout the city in an effort to reduce power outages. Brookland and Woodridge have now had two three-day outages in twelve days – that’s two restocking trips to the local groceries for spoiled milk and meat. A commitment to making sure that this doesn’t happen again would go a long way with area residents to soothe irritated nerves over the loss of household budget control amid recurring storm losses. Good piece. Can DC residents lobby congress to get power lines buried? I would wave a sign for that. I imagine many of the other 39k people still without power in DC would, too. (public company, info should be available) and look at what it costs in overtime, hiring other crews from other states for these repairs, and tally that up along with the costs for tree trimming, be sure to include any power outages due to traffic accidents(cars into poles) the loss of revenue, cause Pepco is not making money off of these outages, and figure that versus the cost of undergrounding. And I would keep this data as a comparison so that if they do underground it can be used against them if they want to increase rates in the future. If they aren’t having to pay nearly the costs as before they would have to start offering lower rates! Make it a part of the contract. I don’t think you realize how much longer it takes to repair underground utilities! And the cost associated! It’s not the power companies fault a major storm rolled thru! Thanks for the note. Yes, it takes longer to repair underground lines. Outages are also a lot less frequent. No, it’s not free, but with $238M in dividends paid by Pepco last year, that’s 238 miles of underground lines that would save the ratepayers hundreds in lost groceries each year. Nice job tommy! Your obviously uneducated in the power business. 238 miles of underground lines will only get you so far, it’s not like driving a mile and your done! A neighborhood can use miles of underground itself. Every time it rains and the water soaks into the soil there are tons of associated outages! But you’ll probably respond with put it in conduit, o yea that’s even more money! Some of the underground wire is about 70 per foot. I think you should talk with your neighbors and try to rally up money to install one another’s underground to the transformer, because that will become your responsibility. How much money will you fork out to repair that once it goes. which it will! Sunshine and beaches, try not to be so arrogant next time! Some minor inaccuracies, Brad – thanks for putting this out there. The Brookland streetscape project was $12 million, which included money to underground powerlines for the two miles along 12th Street. DDOT worked together with Pepco to fight this. Vincent Orange, while slippery, is not stupid. He would never assert a cost on that project. He had a legion of power engineers line up behind a $30+ million quote. This is why Pepco paid him, to keep Ward 5 in line. Pepco did have a cost estimate that was laughably stratospheric, and big Vince defended it with vehemence. We did research with the Edison Institute, and arrived at a cost of $3-$4 million/mile, mainly due to the complexity of the 12th street Comcast and Verizon trunks. We had concurrence with a number of power engineers and line experts. In the end, it is interesting to note, that the projects along Monroe and Michigan NE will feature undergrounded powerlines. I don’t have the data, but I’ll bet my next paycheck it cost less than $30 mil.